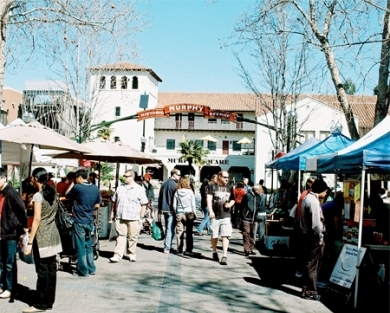 Located in the heart of downtown Sunnyvale on Murphy Avenue and Washington, the Sunnyvale farmers market is a Happy Boy favorite. Saturday markets in Sunnyvale boom with large crowds of friendly folks eager to get their hands on local organic produce. This market boasts over 50 vendors with everything you need under the sun. Take a stroll through the market end to end and you will find great organic veggie and fruit vendors with seasonal produce brought fresh that morning just for you! As a CCOF Certified Organic Local Producer, we are dedicated to bringing the best of our veggies and fruit to market. All Happy Boys work hard to maintain and exceed our reputation as one of the best organic farms in the Bay and Central Coast area. If you haven’t tried our produce yet, well, you’re missing out! If you’re looking for that one item that might get you hooked for life, look out for our famous heirloom tomatoes this summer. We also have other addictive items year round, from fresh bunched greens to flavorful carrots. Our stand is currently located in the front of the charming Palace Café, who also shops at Happy Boy for their baby mixed salad green needs. (Try their omelets and lattes, they’re to die for.) Featuring seasonal produce, it’s easy to find something to spark your inner chefs interest under the Happy Boy tent no matter what time of year. By far, the Sunnyvale local obsession is our organic baby spinach. Sunnyvale actually requires the largest quantity spinach relative to market size that any of our other markets - In other words a WHOLE LOT OF SPINACH. They sure do love the stuff!!! Another favorite are our pre-made bags of baby mixed greens with beautiful edible flowers such as nasturtiums, calendula, and bachelor buttons included. Make sure to give one of our half pound bags a try next time you see Happy Boy, a little olive oil and balsamic bring out the best in this winning mix. Prepared food vendors are also a plenty at the Sunnyvale market. Apart from the vendors though, Sunnyvales downtown retail and restaurants really come alive around 10am. A pastime for many customers is to shop Happy Boy while they wait for tables to open at bustling breakfast cafes and lunch spots. Sunnyvale market is really a great community space for locals to catch up with each other and enjoy the lively atmosphere bolstering with friendly morning faces. 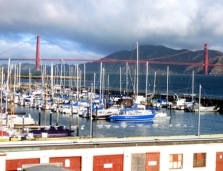 The proximity of the market to many folks homes allows for a short walk or bike ride for many. For those who don’t live as close, there is always ample parking directly behind the prepared food vendors. The market association that facilitates the market itself is Urban Village, whose excellent managers Sarah and Josh are always on top of making every persons market experience the best it can be. Happy Boy loves Sunnyvale!! !